We took the kiddies to the Rockettes yesterday - awesome kitsch, enjoyed by all. I came home with many yards of mylar streamers stuffed into my bag. Across the street from Radio City, I got the perfect Christmas card picture of the girlie - and got the cards ordered last night. When I got home yesterday - not only had W. hung the lights up on the outside of the house, he was making steak and spätzle for dinner. There were soft, fragrant, clean sheets on my bed last night. The hot cider from the greenmarket this morning had a mess of sliced apples in it. The sky is blue and the sun is out even though it is bitter cold outside. 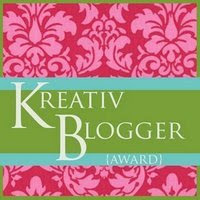 I am supposed to pass the award along to six other blogs, but that seems to be beyond me today. Revel in the general creativity of the blogosphere! Hooray for mylar streamer (but don't let them lose, they will short out electrical wires outside--I had a mylar kite--don't ask. Hooray for a family who loves us, a warm home, enough food in our bellies and our health. Mostly hooray for love. Gotta love a man who cooks! I've wanted to see the Rockettes as long as I can remember. I'm feeling those high kicks vicariously. There is just magic in clean fresh sheets. Maybe i should change mine. my list includes: delicious lunch paid for by a woman who is going to be one of my bosses, and who I like a lot personally and professionally. So was your daughter really thrilled with the Rockettes trip? I'd love to take my kids someday. Isn't it crazy how the sun being out can make such a huge difference in the way we feel? There is NOTHING as great as crawling into fresh, clean sheets. And i mean NOTHING. I'm so glad today is good. May tomorrow be too. ahhh, the simple joys, like fresh, crisp, clean sheets (ok, maybe crisp is going a bit too far). but yes, clean sheets can get my happy engine purring! I've always wanted to see the Rockettes! Well, I've always wanted to dance onstage at Radio City Music Hall too, but the former seems more likely. One of my school pals fulfilled the dream while she was working in NYC one Christmas season. What a happy list. I share in your happy. Do we get to see your perfect picture of the girlie? And I want some cider. A blue sky lifts my heart every time. I'm convinced that I'm as consistently happy as I am because I live in San Diego, where blue sky abounds. Then again, it's all I've ever known. Maybe I'm a snow person? Nah. Clean bedlinen ~ one of my favourite things! I've never had spätzle but I've watched Rick Stein cooking them on the TV, pouring the batter through a colander into his boiling water. Looks cool, I'd love to give it a try. Glad to know someone else who thinks number 4 is heaven on a stick! Congratulations on the award! And, yes- it's those little things like clean sheets, clear cold weather, and the Rockettes that make such great memories. Seeing the Rockettes at Christmas time is one of my secret kitschy fantasties. Where there any wardrobe malfunctions? That would be the icing on the cake. Mmm..fresh sheets are the best. And I still have glorious memories of going to Radio City when I was a kid. Fun! Steak and Spaetzle. Wow. Just, Wow. And such a pretty award! Yay, for you, but more for the slice of happiness. Didn't they spell "Creative" wrong? Oh, I see! They're being creative. But all this talk of fresh sheets. That is the awesome. Almost makes me want to go change them now. Almost. It is a lot of work, after all. I love fresh sheets and when combined with brand new socks (I wear socks to sleep), it increases the joy exponentially for me.